In the 1980s, Cardiff boasted two national television centres, the internationally renowned Welsh National Opera, two leading classical orchestras, the Welsh College of Music and Drama, several strong drama and musical societies, and a number of leading performers and entertainers. Against this background, a group of Cardiff Freemasons connected to Orbit Theatre Company were keen to form a lodge with members connected in some way to entertainment. Proscenium Lodge is the result. We meet four times a year in Cardiff Masonic Hall on three Tuesday and one Wednesday evenings and are a dining lodge, with dining dress in the lodge and for the dinner taken in the after proceedings. Members of the lodge include performers of all types, actors, singers, musicians plus directors and producers amateur and professional and other links to “entertainment”. 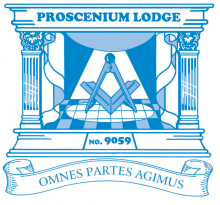 Proscenium Lodge has an associated Royal Arch Chapter, also no. 9059, for Master Masons.